It was an easy day's sail from Bonaire to Curaçao. We arrived in the perfect shelter of Spanish Waters around 3pm on Hogmanay (New Year's Eve). The floating bar at Sarifundy's Marina had a party organised so, along with many other boat people, we turned up there ready for the usual celebrations. At midnight, the Dutch tradition of New Year fireworks became apparent - it was like an air-raid! Add to this Tom playing the pipes and it was bedlam. 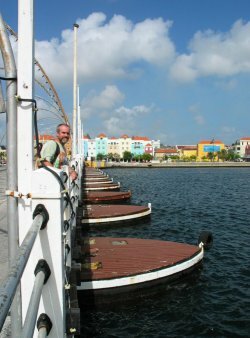 Curaçao is very Dutch in character, especially the main port of Willemstad with it's old Dutch architecture and red-tiled roofs. 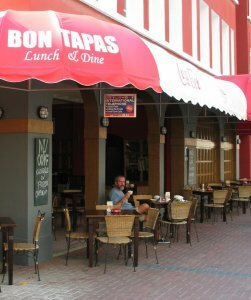 It also has a cafe (the Bon Tapas) that serves the best Dutch apple pie ever made! 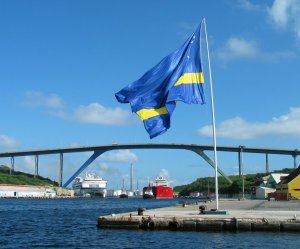 Looking across to Otrabanda, the western half of Willemstad, with the pontoon bridge to the left. The Queen Emma Pontoon Bridge swings open regularly to allow the passage of cruise ships and tankers into St Annabaai. Pedestrians use it to cross between the two halves of Willemstad, Punda and Otrabanda. The Juliana Bridge, built in 1975, is the highest bridge in the Caribbean. The chimneys of the Isla Oil Refinery are in the distance. 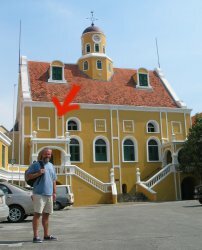 The island still has many of the old plantation houses, one of which houses the Curaçao Liqueur factory. We went there and did the tour. Curaçao liqueur is flavoured using the dried skins of wee bitter oranges and in spite of it's choice of 5 garish colours (including the blue one that stands out on every bar), it tastes pretty good. Fort Amsterdam. The arrow shows a British cannonball, fired by a warship, still stuck in the wall after 200 years. Theo, Sue and Monique from Sutemon were also in Curaçao and we shared a hire car for a day to see the rest of the island. The exposed east coast of the island. We also visited several museums in Willemstad, including the excellent Maritime Museum and Kura Hulanda, which houses a big collection of traditional artifacts from West Africa in addition to those of the Afro-Caribbean. The main exhibit concentrates on the slave trade, the West African people, their empires and cultures. Other exhibits include a complete set of fossils representing the evolution of humans and a tribute to Abraham with a collection of bronze and ceramic artifacts from the Middle East dating from 2500 BC to about 300 AD. If you're having a bad day, get one of these guys and hammer a nail or two into it to get rid of your frustration. 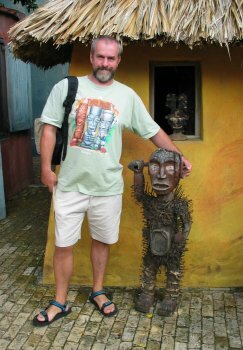 Tom and friend at Kura Hulanda Museum. 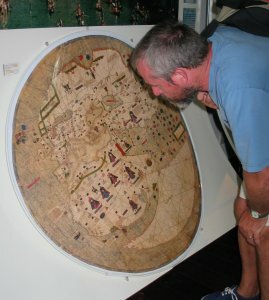 At the Maritime Museum Tom inspected the 1375 Catalan Mapamundi (world map), which claimed to be "a much improved map". Think we'll stick to our current charts thanks! The sun did not shine every day - one day the streets of Willemstad were flooded by a tropical downpour, but we're used to splashing about in water! Us with Karl and Genevieve. We found the people of Curaçao to be very cheery and helpful folk. Shown here are Genevieve and her husband Karl, two of the best! Genevieve works at the tourist information kiosk in Willemstad and when we asked how to get up the Juliana bridge to take photos, she offered to take us up there by car when she finished work. We spent a couple of hours with Genevieve and Karl and had a fun time. Karl even drove us "home" to Spanish Waters. Willemstad as viewed from the sea, with the Riffort ("Reef Fort") on the shoreline on the left bank and the Water Fort on the right. The Water Fort, originally built in 1643, is now a hotel, but retains most of the 35 foot thick walls and ramparts. On 22 January we headed out of the harbour and set a course for Cartagena in Colombia. Unfortunately, Sue had a bad cold and this somehow made her susceptible to seasickness. During "the night of the long spew", we altered course for the island of Aruba, to give Sue a chance to recover.